With so many different roulette variations flying around, it is no wonder that some online Canadian gamblers started to crave the classic version. A stylish, old school variety of the ever popular online casino table game. That's exactly where Euro Gold came from, a new game that takes plenty of influence from the original format of online roulette whilst adding in the newest top-of-the-range graphics. It is because of these features that it has remained a popular online roulette variant in Canada. As with French Roulette, Euro Gold has a wheel with 37 slots. 36 for the numbers 1-36, half red and half black, and a green slot for the number zero. With no fancy rules and with a slick and minimalist layout, Euro Gold is one of the easiest forms of online roulette for new players to understand and enjoy. You place your bets (more on this later) on colour-coded numbered spaces on the table, which is divided into three columns. Then you let the dealer spin the roulette wheel, throw in the ball, and wait for it to land in one of the numbered slots. Where the ball ends up will determine whether your bet wins or loses. Euro Gold Roulette is a product of the online era, with top online casino sites able to introduce stylish top-of-the-range graphics to a popular and enduring variant of the game. However the genesis of the original European Roulette on which it is based is quite interesting. The game originated in Germany in the mid-19th century, and is credited to Louis and Francois Blanc, two brothers from France. It is notable for being the first variant of roulette to begin life with just one zero on the wheel rather than two, thus reducing the house edge and improving the player experience. As a product with its origins in the realm of online roulette, Euro Gold has no natural equivalent in the offline space. Some casinos in Las Vegas will offer real money European Roulette, often with impressive graphics, but you are unlikely to find anything comparable in Canada, where American Roulette continues to rule the roost. Many of the best online casinos take real pride in Euro Gold Roulette, and as such it is one of the most impressive looking casino table games on a lot of Canadian sites. It is also, of course one of the more readily available, with players able to play Euro Gold at Canadian online casinos for a variety of different betting stakes. What is Euro Gold Roulette? Euro Gold is one of the most exciting games to spin out of the Roulette tradition. For Canadian players, it is a very popular variety. Because of its popularity, it won't be hard finding it online. We caution you, however, to make sure you choose highly regarded sites like the ones we have listed here. It is based on the European style of play, which is the most popular international version. 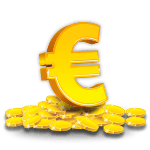 Euro Gold is different in that it is a one to one game - meaning that it will be just you and the wheel at play. There will be no additional players to become tangled up with. This high paced action game is played pretty much like you would any Roulette table online, except that it is just between you and the online casino wheel. You can anticipate great odds in your favour, as well as spectacular 3D graphics. You play it just like you would an online game of European Roulette. Does it use the familiar bets and table layout? It does use the same ole' familiar bets as a standard European Roulette game. The key difference is that it is just between you and the Roulette wheel. Euro Gold is played with 37 number slots - 36 plus a single zero. The odds are so great that many online casinos will not let you count this game towards welcome bonuses. So, you will want to make sure that you have found online casinos that are secure enough that they aren't worried about you winning big with Euro Gold. Euro Gold is one of the most popular table games online, especially when it comes to online Roulette. The odds are spectacular. The graphics are stellar, and the real money winnings are in your favour. The biggest difference is the out of this world graphics. When you signal the spin, you hear the wheel spinning, the ball dropping, plus the sounds of the dealer. All your senses are poised for a big win. Another key difference is that it is just you and the table. Yes, you get it all to yourself. How are the odds different? The odds are not different from a standard European variety. It is different from what most Canadians and US players are used to, which is the American variety. European house edge is 2.7%, while American house edge is 5.26%. The added double zero with American Roulette makes a big difference. Can I use a Roulette system? You can use a system when playing online Roulette. However, many will tell you that it is really a waste of time and energy in the long run. The best strategy is to always play wise, avoid chasing numbers, and be a respecter of your bankroll. If you want to find out more about strategies, then look no further because we have taken the time to list some of the most used strategies like Martingale, Paroli, and more. Euro Gold is one of the most popular online Roulette varieties. We know you can pretty much find it anywhere you look. However, we caution you to not just dive in willy-nilly and land in a rogue site. Because of that, we have applied over 20 years of experience to the task of locating some real beauties when it comes to great bonuses, superstar graphics, and top of the line customer service.